Skywatchers can view the Eta Aquarids meteor shower through most of May 2017. But the most spectacular display will happen when the meteor shower peaks during the early morning hours of May 5th and May 6th, 2017. While not as intense or brilliant as other meteor showers during 2017, Eta Aquarid meteors are known for their speed - traveling at about 66 km/s (148,000 mph) into Earth's atmosphere. Fast meteors can leave glowing "trains" (incandescent bits of debris in the wake of the meteor) which last for several seconds to minutes. Eta Aquarids are pieces of debris left over from comet 1P/Halley. Every 76 years, Halley's Comet returns to the inner solar system and its nucleus sheds a layer of ice and rock into space. The dust grains left by Halley's Comet eventually become the Eta Aquarids in May and the Orionids in October if they collide with Earth's atmosphere. The Eta Aquarids will be viewable all over the world during predawn hours. In 2017, the Moon will set during the peak viewing times of 3 a.m. to 5 a.m from May 4th through 7th which will darken the night sky and help make the meteor shower easier to see. 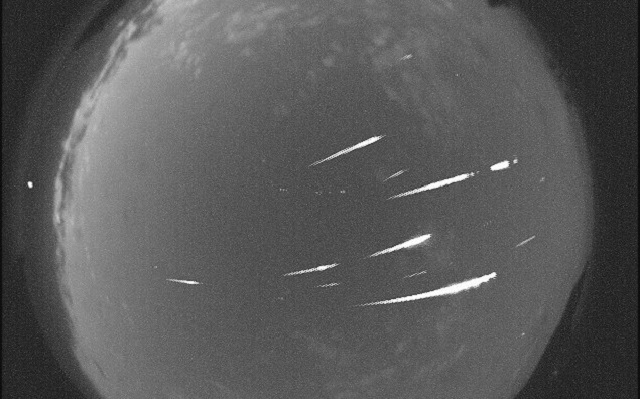 Although the southern hemisphere has the better view, the Eta Aquarids are capable of producing 30 meteors per hour during the meteor shower's peak in the Northern Hemisphere (and around 10 meteors per hour during the dates before and after the peak). Cloudless skies and far away from city lights are ideal for watching meteor showers. Lie on your back and look straight up. You can tell if a meteor belongs to a particular shower by tracing back its path to see if it originates near a specific point in the sky, called the radiant. The constellation in which the radiant is located gives the shower its name. In this case, Eta Aquarids appear to come from a point in the constellation of Aquarius. Aquarius is higher up in the sky in the Southern Hemisphere than it is in the Northern Hemisphere. In the Northern Hemisphere, Eta Aquarid meteors can be seen as "earthgrazers." Earthgrazers are long meteors that appear to skim the surface of the Earth at the horizon.